The use of water creates waste-water, which must be appropriately collected and treated before being reintroduced into the natural water cycle for reasons of sustainability and water provision. The composition and amount of waste-water produced depend on a variety of factors (households, industry, standard of living, etc.) and determine the required treatment measures. In Austria, waste-water disposal is regulated by the Wasserrechtsgesetz (water right law) and numerous other regulations (e.g. waste-water emission regulation). Relevant guidelines at a European level are the municip l waste-water guideline (91/271/EEC), the dangerous substances guideline (2006/11/EC) and the water framework guideline (2000/60/EC). Waste-water is usually treated in large sewage works, to which the waste-water is often pumped in kilometre-long underground pipes in order to be transported; a process that consumes a lot of energy. High investments and high running costs are typical for this common type of waste-water disposal. These costs, which can be particularly high in rural areas, must be borne by the citizens. Through the development of the Bioferm waste-water concept, which is characterised by decentralised waste-water treatment in connection with micro-organisms, cost-effective solutions can be achieved here as regards both the primary investments as well as the running costs. The Bioferm waste-water concept has been approved by the European Union (EC registration 512990031 on 14 April 2005) and meets all standards of modern waste-water treatment. 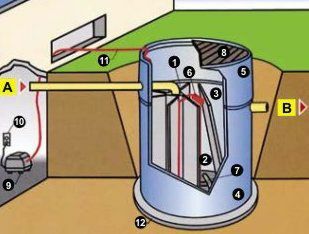 The treated waste-water can be diverted into a receiving water course, a storm-water drain or into a soakaway without reservations. The plant consists of a bio reactor and a sludge container that was designed and developed further by the company Bioclar over many years. The reactor serves to treat the waste-water and to separate the sludge/water mixture. Excess sludge created by the bio reactor is stored in the sludge container. Micro-organisms are added to the waste-water by means of a dosing pump (dosage according to the population equivalent (PE)). This newly developed process ensures a reduction in the amount of bulking sludge and floating sludge. In comparison to previously employed oxidation processes, this new method ensures a reduction of the colour bacteria that are responsible for the formation of floating sludge. In this way, all odour nuisances are eliminated. The use of micro-organisms for 6 PE is approx. 10 litres per year. Bioferm waste-water plants are manufactured completely from waste-water-resistant plastic (polypropylene) and are delivered as compact units, incl. switch cabinet and fan. They are built in modular form according to the requirements, i.e. the amount of waste-water produced. By using new production technologies, a 100% seal-tightness is ensured, which has the advantage over previously used concrete technology that a leakage inspection by the authorities after installation may not be necessary. The BSB5, CSB, N and P values are seen as an indication of the degree of pollution. The BSB5 value is the biochemical oxygen requirement that is needed by micro-organisms to break down organic substances. The consumption of oxygen is therefore directly proportional to the amount of organic contaminants in the substance. The CSB value is the chemical oxygen requirement that is needed to break down all oxidisable substances (organic and inorganic compounds). Two important additional parameters are the N and P values. They define the pollution levels of waste-water according to the content of the plant nutrients nitrogen (N) and phosphorous (P). 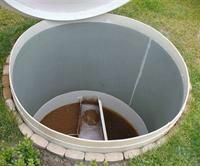 Bioferm therefore meets all standards of modern waste-water treatment; the treated waste-water can be diverted into a receiving water course, a storm-water drain or into a soakaway without reservations. 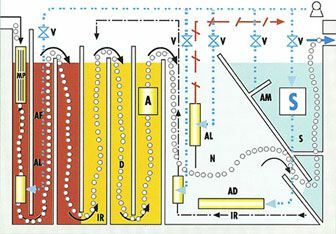 In the case of a B6 plant, provision must be made for a 6-month storage of waste-water sludge as 0.3 m3 of volume per PE. The sludge can be extracted in urban areas by a waste disposal company or, in rural areas, extracted using a manure-barrel pump and then dispersed over fields and meadows. The waste-water sludge can be filled into bags as construction fleece, then dried in the sun and mixed in with fuel for a chippings plant to provide heat. If one uses the waste-water sludge oneself (for agricultural purposes or burning), the first inspection of process values for the plant must also include an analysis of the sludge and its contents; if the sludge is extracted by a commercial waste disposal company, then this analysis is not necessary. Subsidies can be granted for individual plants in rural areas, but also for public municipal plants. Municipal waste-water plans should be consulted in order to determine which type of subsidy applies for the establishment of a waste-water plant. If the plant is to be located outside the “Yellow Line” area determined by the municipality, applicants can utilise the relevant provincial and national subsidies. If the plant is to be located within the “Yellow Line” area determined by the municipality, only the relevant municipal subsidy can be utilised. The height of subsidies for waste-water plants differs from province to province in Austria. The applicable amounts can be viewed in the relevant publications on the internet pages of the provincial governments. The areas of application for the Bioferm waste-water concept range from detached houses, blocks of flats or housing estates, hostels and lodges, restaurants, schools, kindergartens, camping sites, agricultural and industrial businesses to municipal solutions (villages, towns, cities). The degree of treatment meets EU standards, and the treated waste-water can subsequently be diverted into a receiving water course, a storm-water drain or into a soakaway. Bioferm waste-water plants are available from 6 PE (population equivalent); existing aerobic waste-water plants can be adapted. With the Bioferm waste-water concept, cost-effective solutions can be achieved as regards both the primary investments as well as the running costs. Contact us for an individual consultation.